The third and final day of racing brought light winds to an eager fleet. The Norman and Sol course got off a few races to shake up the leader board and determine the champions for the weekend. Meet some of them and some other teams with a great story. The Mount Gay Rum Party was a blast on Friday night with a sandbag grinding competition, prizes on a wheel, band, dancing in the sand and daily awards. Racing for Saturday was canceled, due to light air, so we took a tour of a few of the boats in the 90-boat fleet. T2PTV: Sailing On Demand videos above published Mar 30-31, 2019. With the Sailing Festival complete, today was the first day of racing for the BVI Spring Regatta! Fair winds, a hard-working race committee and 90+ boats on two race courses in Sir Francis Drake Channel. T2PTV: Sailing On Demand video above published Mar 29, 2019. See also BVI Spring Regatta & Sailing Festival preview video. Plenty of buzz added to the fun vibe around the docks in Nanny Cay as boats returned after close racing in all classes. Gunboat 62 Mach Schnell, owned and skippered by Kent Haeger also broke Triple Jack's 2015 record in 2:00:39, taking first in the multihull class on corrected time. The Rapido 60 trimaran owned and skippered by Steve Bourne also broke the 2015 record finishing in 2:19:54. Sailing with the same crew of eight who recently won the Caribbean 600, Fujin owner/skipper Greg Slyngstad commented, "Today's race was one of the reasons we came out - the weather conditions looked good to try for the record. Mach Schnell was pushing us hard, it was a lot of fun, and we've raced against Triple Jack in the past and in lighter air they've beaten us. Conditions were really excellent, we saw over 25 knots but it was steady at 19-21 most of the race, with big puffs and lulls coming over the island on the north side - we're getting the boat figured out!" Rob Butler on Touch2PlayRacing is back for his fifth #BVISR! “Our best memory of the event was almost winning last year; we lost to a great bunch of guys on a Melges 24! 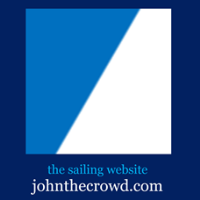 We really like the blend of windward/leeward & point to point racing!"